This is a really pretty First Love Creamer and Sugar Bowl set made by Duncan and Miller Glass. The Creamer measures 3 3/4 inches high. The Sugar Bowl measures 3 1/8 inches high. They are both in very good condition with no chips, cracks or scratches. We guarantee items to be as described. THANK YOU. 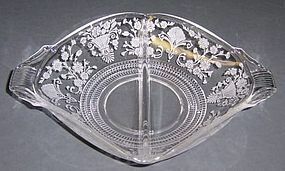 This really pretty crystal clear First Love 8 1/4 Inch High Cornucopia Flower Vase was made by Duncan and Miller Glass. This vase measures 5 inches in diameter across the top ad is in very good condition with no chips or cracks. Be sure to see our other Duncan and Miller glass available. We guarantee items to be as described. THANK YOU. 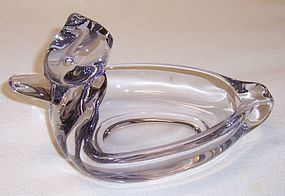 This pretty crystal Duck Ash Tray was made by Duncan and Miller Glass. This Ash Tray measures 7 1/2 inches long X 4 3/4 inches across. It is in very good condition with no chips or cracks. Be sure to search our other Duncan and Miller Glass available. We guarantee all items to be as described. THANK YOU. This pretty blue opalescent Cornucopia was made by Duncan and Miller Glass. 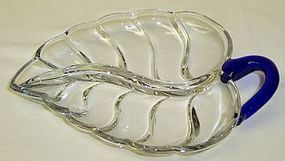 This Cornucopia measures 12 3/4 inches long and is in very good condition with no chips, cracks or scratches. Be sure to search our other Duncan and Miller glass available. We guarantee all items to be as described. Feel free to email with any questions. THANK YOU. 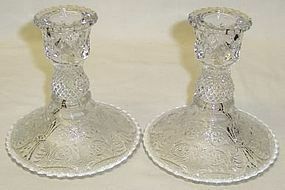 This is a pretty pair of crystal Sandwich 4 1/2 Inch high Single Candle Sticks made by Duncan and Miller Glass. Both Candle sticks are in very good condition with no chips, cracks or scratches. Be sure to search our other Duncan and Miller Sandwich glass available. We guarantee all items to be as described. Feel free to email with any questions. THANK YOU. This really pretty crystal 2-Section Leaf Relish with Blue Handle was made by Duncan and Miller Glass. This Relish measures 7 inches long X 6 inches across. It is in excellent condition with no chips, cracks or scratches. Be sure to search our other Duncan and Miller glass available. We guarantee all items to be as described. Feel free to email with any questions. THANK YOU.